This article is about the BIOS as found in IBM PC compatibles. For the general concept, see firmware. For similar programs on non-PC systems, see booting. For other uses, see Bios (disambiguation). The BIOS (/ˈbaɪ.ɒs/, an acronym for Basic Input/Output System and also known as the System BIOS, ROM BIOS or PC BIOS) is a type of firmware used to perform hardware initialization during the booting process (power-on startup) on IBM PC compatible computers, and to provide runtime services for operating systems and programs. The BIOS firmware is built into personal computers (PCs), and it is the first software they run when powered on. The name itself originates from the Basic Input/Output System used in the CP/M operating system in 1975. Originally proprietary to the IBM PC, the BIOS has been reverse engineered by companies looking to create compatible systems and the interface of that original system serves as a de facto standard. The fundamental purposes of the BIOS in modern PCs are to initialize and test the system hardware components, and to load a boot loader or an operating system from a mass memory device. The BIOS additionally provides an abstraction layer for the hardware, i.e., a consistent way for application programs and operating systems to interact with the keyboard, display, and other input/output (I/O) devices. Variations in the system hardware are hidden by the BIOS from programs that use BIOS services instead of directly accessing the hardware. MS-DOS (PC DOS), which was the dominant PC operating system from the early 1980s until the mid-1990s, relied on BIOS services for disk, keyboard, and text display functions. MS Windows NT, Linux, and other protected mode operating systems in general ignore the abstraction layer provided by the BIOS and do not use it after loading, instead accessing the hardware components directly. Versions of MS-DOS, PC DOS or DR-DOS contain a file called variously "IO.SYS", "IBMBIO.COM", "IBMBIO.SYS", or "DRBIOS.SYS"; this file is known as the "DOS BIOS" (also known as "DOS I/O System") and contains the lower-level hardware-specific part of the operating system. Together with the underlying hardware-specific, but operating system-independent "System BIOS", which resides in ROM, it represents the analogous to the "CP/M BIOS". With the introduction of PS/2 machines, IBM divided the System BIOS into real-mode and protected mode portions. The real-mode portion was meant to provide backward-compatibility with existing operating systems such as DOS, and therefore was named "CBIOS" (for Compatibility BIOS), whereas the "ABIOS" (for Advanced BIOS) provided new interfaces specifically suited for multitasking operating systems such as OS/2. The first commercial licensing of CP/M took place in 1975 with contracts between Digital Systems and Omron of America for use in their intelligent terminal, and with Lawrence Livermore Laboratories where CP/M was used to monitor programs in the Octopus network. Little attention was paid to CP/M for about a year. In my spare time, I worked to improve overall facilities […] By this time, CP/M had been adapted for four different controllers. […] In 1976, Glenn Ewing approached me with a problem: Imsai, Incorporated, for whom Glenn consulted, had shipped a large number of disk subsystems with a promise that an operating system would follow. I was somewhat reluctant to adapt CP/M to yet another controller, and thus the notion of a separated Basic I/O System (BIOS) evolved. In principle, the hardware dependent portions of CP/M were concentrated in the BIOS, thus allowing Glenn, or anyone else, to adapt CP/M to the Imsai equipment. Imsai was subsequently licensed to distribute CP/M version 1.3 which eventually evolved into an operating system called IMDOS. The BIOS of the original IBM PC XT had no interactive user interface. Error codes or messages were displayed on the screen, or coded series of sounds were generated to signal errors when the power-on self-test (POST) had not proceeded to the point of successfully initializing a video display adapter. Options on the IBM PC and XT were set by switches and jumpers on the main board and on peripheral cards. Starting around the mid-1990s, it became typical for the BIOS ROM to include a "BIOS configuration utility" (BCU) or "BIOS setup utility", accessed at system power-up by a particular key sequence. This program allowed the user to set system configuration options, of the type formerly set using DIP switches, through an interactive menu system controlled through the keyboard. In the interim period, IBM-compatible PCs—​​including the IBM AT—​​held configuration settings in battery-backed RAM and used a bootable configuration program on disk, not in the ROM, to set the configuration options contained in this memory. The disk was supplied with the computer, and if it was lost the system settings could not be changed. A modern Wintel-compatible computer provides a setup routine essentially unchanged in nature from the ROM-resident BIOS setup utilities of the late 1990s; the user can configure hardware options using the keyboard and video display. Also, when errors occur at boot time, a modern BIOS usually displays user-friendly error messages, often presented as pop-up boxes in a TUI style, and offers to enter the BIOS setup utility or to ignore the error and proceed if possible. Instead of battery-backed RAM, the modern Wintel machine may store the BIOS configuration settings in flash ROM, perhaps the same flash ROM that holds the BIOS itself. When we failed to produce an operating system in a timely manner, Glenn started talking with Gary about CPM […] It took several months of twisting Gary's arm to get Gary to port it to the 8080. The final success came when Glenn talked Gary into just separating the I/O from the rest of it, with Glenn promising to re-write the I/O module for the IMSAI 8080 (which he did). So CPM on the IMSAI was a joint effort between Glenn and Gary. Glenn […] would be talking with Gary, and he started twisting Gary's arm. He said, "Hey Gary, why can't we run this in this IMSAI?" "The I/O's all different, won't run." But Glenn persists and finally makes a deal with Gary. He says, "Okay Gary, if you split out the I/O, I'll write the BIOS, basic I/O's system," and Glenn named it then. "We'll split it out separately. I'll write that part, as long as you can make a division in the program there." And he got Gary to do that and Glenn put those two pieces together and was running Gary's CP/M on an IMSAI. Glenn let us know that, and it wasn't too much later than Bill was down there making arrangements with Gary Kildall to license CP/M. […] Now that the BIOS is separated out, anybody could write a BIOS for their machine, if it was 8080-based, and run this, so he started selling that separately under the company Digital Research that he formed and did quite well." Early Intel processors started at physical address 000FFFF0h. When a modern x86 microprocessor is reset, it starts in pseudo 16-bit real mode, initializing most registers to zero. The code segment register is initialized with selector F000h, base FFFF0000h, and limit FFFFh, so that execution starts at 4 GB minus 16 bytes (FFFFFFF0h). The platform logic maps this address into the system ROM, mirroring address 000FFFF0h. If the system has just been powered up or the reset button was pressed ("cold boot"), the full power-on self-test (POST) is run. If Ctrl+Alt+Delete was pressed ("warm boot"), a special flag value is stored in nonvolatile BIOS memory ("CMOS") before the processor is reset, and after the reset the BIOS startup code detects this flag and does not run the POST. This saves the time otherwise used to detect and test all memory. The POST checks, identifies, and initializes system devices such as the CPU, RAM, interrupt and DMA controllers and other parts of the chipset, video display card, keyboard, hard disk drive, optical disc drive and other basic hardware. Early IBM PCs had a little-known routine in the POST that would attempt to download a maintenance program into RAM through the keyboard port before performing any other elements of the boot process, such as before scanning for option ROMs or executing a boot loader. (No serial or parallel ports were standard on early IBM PCs, but a keyboard port of either the XT or AT / PS/2 type has been standard on practically every PC and clone.) If the download was apparently successful, the BIOS would verify a checksum on it and then run it. This feature was intended for factory test or diagnostic purposes; while it was of limited utility outside of factory or repair facilities, it could be used in a proprietary way to boot the PC as a satellite system to a host machine (as it was used in the manufacturing environment). After the option ROM scan is completed and all detected ROM modules with valid checksums have been called, or immediately after POST in a BIOS version that does not scan for option ROMs, the BIOS calls INT 19h to start boot processing. Post-boot, programs loaded can also call INT 19h to reboot the system, but they must be careful to disable interrupts and other asynchronous hardware processes that may interfere with the BIOS rebooting process, or else the system may hang or crash while it is rebooting. When INT 19h is called, the BIOS attempts to locate boot loader software held on a storage device designated as a "boot device", such as a hard disk, a floppy disk, CD, or DVD. It loads and executes the first boot software it finds, giving it control of the PC. This is the process that is known as booting (sometimes informally called "booting up"), which is short for "bootstrapping". The BIOS proceeds to test each device sequentially until a bootable device is found, at which time the BIOS transfers control to the loaded sector with a jump instruction to its first byte at address 0x0000:0x7C00 (exactly 1 KiB below the 32 KiB mark); see MBR invocation and VBR invocation. (This location is one reason that an IBM PC requires at least 32 KiB of RAM in order to be equipped with a disk system; with 31 KiB or less, it would be impossible to boot from any disk, removable or fixed, using the BIOS boot protocol.) Most, but not all, BIOSes load the drive number (as used by INT 13h) of the boot drive into CPU register DL before jumping to the first byte of the loaded boot sector. Note well that the BIOS does not interpret or process the contents of the boot sector other than to possibly check for the boot sector signature in the last two bytes; all interpretation of data structures like MBR partition tables and so-called BIOS Parameter Blocks is done by the boot program in the boot sector itself or by other programs loaded through the boot process and is beyond the scope of BIOS. Nothing about BIOS predicates these data structures or impedes their replacement or improvement. A non-disk device such as a network adapter attempts booting by a procedure that is defined by its option ROM or the equivalent integrated into the motherboard BIOS ROM. As such, option ROMs may also influence or supplant the boot process defined by the motherboard BIOS ROM. The user can control the boot process, to cause one medium to be booted instead of another when two or more bootable media are present, by taking advantage of the boot priority implemented by the BIOS. For example, most computers have a hard disk that is bootable, but usually there is a removable-media drive that has higher boot priority, so the user can cause a removable disk to be booted, simply by inserting it, without removing the hard disk drive or altering its contents to make it unbootable. In most modern BIOSes, the boot priority order of all potentially bootable devices can be freely configured by the user through the BIOS configuration utility. In older BIOSes, limited boot priority options are selectable; in the earliest BIOSes, a fixed priority scheme was implemented, with floppy disk drives first, fixed disks (i.e. hard disks) second, and typically no other boot devices supported, subject to modification of these rules by installed option ROMs. The BIOS in an early PC also usually would only boot from the first floppy disk drive or the first hard disk drive, even if there were two drives of either type installed. All more advanced boot priority sequences evolved as incremental improvements on this basic system. Historically the BIOS would try to boot from a floppy drive first and a hard disk second. The default for CD or DVD booting is an extension of this. With the El Torito optical media boot standard, the optical drive actually emulates a 3.5" high-density floppy disk to the BIOS for boot purposes. Optical disks are a special case, because their lowest level of data organization is typically a fairly high-level file system (e.g. ISO 9660 for CD-ROM). Reading the "first sector" of a CD-ROM or DVD-ROM is not a simply defined operation like it is on a floppy disk or a hard disk. Furthermore, the complexity of the medium makes it difficult to write a useful boot program in one sector, even though optical media sectors are typically 2048 bytes each, four times the standard 512-byte size of floppy and legacy hard disk sectors. Therefore, optical media booting uses the El Torito standard, which specifies a way for an optical disk to contain an image of a high-density (1.44 MB) floppy disk and for the drive to provide access to this disk image in a simple manner that emulates floppy disk drive operations. Therefore, CD-ROM drives boot as emulated floppy disk drives; the bootable virtual floppy disk can contain software that provides access to the optical medium in its native format. The behavior if the BIOS does not find a bootable device has varied as personal computers developed. The original IBM PC and XT had Microsoft Cassette BASIC in ROM, and if no bootable device was found, ROM BASIC was started by calling INT 18h. Therefore, barring a hardware failure, an original IBM PC or XT would never fail to boot, either into BASIC or from disk (or through an option ROM). One model of the original IBM PC was available with no disk drive; a cassette recorder could be attached via the cassette port on the rear, for loading and saving BASIC programs to tape. Since few programs used BASIC in ROM, clone PC makers left it out; then a computer that failed to boot from a disk would display "No ROM BASIC" and halt (in response to INT 18h). The environment for the boot program is very simple: the CPU is in real mode and the general-purpose and segment registers are undefined, except CS, SS, SP, and DL. CS is always zero and IP is initially 0x7C00. Because boot programs are always loaded at this fixed address, there is no need or motivation for a boot program to be relocatable. DL contains the drive number, as used with INT 13h, of the boot device, unless the BIOS is one that does not set the drive number in DL – and then DL is undefined. SS:SP points to a valid stack that is presumably large enough to support hardware interrupts, but otherwise SS and SP are undefined. (A stack must be already set up in order for interrupts to be serviced, and interrupts must be enabled in order for the system timer-tick interrupt, which BIOS always uses at least to maintain the time-of-day count and which it initializes during POST, to be active and for the keyboard to work. The keyboard works even if the BIOS keyboard service is not called; keystrokes are received and placed in the 15-character type-ahead buffer maintained by BIOS.) The boot program must set up its own stack (or at least MS-DOS 6 acts like it must), because the size of the stack set up by BIOS is unknown and its location is likewise variable; although the boot program can investigate the default stack by examining SS:SP, it is easier and shorter to just unconditionally set up a new stack. At boot time, all BIOS services are available, and the memory below address 0x00400 contains the interrupt vector table. BIOS POST has initialized the system timers ⟨⟩8253 or 8254 IC), interrupt controller(s), DMA controller(s), and other motherboard/chipset hardware as necessary to bring all BIOS services to ready status. DRAM refresh for all system DRAM in conventional memory and extended memory, but not necessarily expanded memory, has been set up and is running. The interrupt vectors corresponding to the BIOS interrupts have been set to point at the appropriate entry points in the BIOS, hardware interrupt vectors for devices initialized by the BIOS have been set to point to the BIOS-provided ISRs, and some other interrupts, including ones that BIOS generates for programs to hook, have been set to a default dummy ISR that immediately returns. The BIOS maintains a reserved block of system RAM at addresses 0x00400–0x004FF with various parameters initialized during the POST. All memory at and above address 0x00500 can be used by the boot program; it may even overwrite itself. Peripheral cards such as some hard disk drive controllers and some video display adapters have their own BIOS extension option ROMs, which provide additional functionality to BIOS. Code in these extensions runs before the BIOS boots the system from mass storage. These ROMs typically test and initialize hardware, add new BIOS services, and augment or replace existing BIOS services with their own versions of those services. For example, a SCSI controller usually has a BIOS extension ROM that adds support for hard drives connected through that controller. Some video cards have extension ROMs that replace the video services of the motherboard BIOS with their own video services. BIOS extension ROMs gain total control of the machine, so they can in fact do anything, and they may never return control to the BIOS that invoked them. An extension ROM could in principle contain an entire operating system or an application program, or it could implement an entirely different boot process such as booting from a network. Operation of an IBM-compatible computer system can be completely changed by removing or inserting an adapter card (or a ROM chip) that contains a BIOS extension ROM. The motherboard BIOS typically contains code to access hardware components necessary for bootstrapping the system, such as the keyboard, display, and storage. In addition, plug-in adapter cards such as SCSI, RAID, network interface cards, and video boards often include their own BIOS (e.g. Video BIOS), complementing or replacing the system BIOS code for the given component. Even devices built into the motherboard can behave in this way; their option ROMs can be stored as separate code on the main BIOS flash chip, and upgraded either in tandem with, or separately from, the main BIOS. There are many methods and utilities for examining the contents of various motherboard BIOS and expansion ROMs, such as Microsoft DEBUG or the Unix dd. If an expansion ROM wishes to change the way the system boots (such as from a network device or a SCSI adapter for which the BIOS has no driver code) in a cooperative way, it can use the BIOS Boot Specification (BBS) API to register its ability to do so. Once the expansion ROMs have registered using the BBS APIs, the user can select among the available boot options from within the BIOS's user interface. This is why most BBS compliant PC BIOS implementations will not allow the user to enter the BIOS's user interface until the expansion ROMs have finished executing and registering themselves with the BBS API. The specification can be downloaded from the ACPICA website. The official title is BIOS Boot Specification (Version 1.01, 11 January 1996). Also, if an expansion ROM wishes to change the way the system boots unilaterally, it can simply hook INT 19h or other interrupts normally called from interrupt 19h, such as INT 13h, the BIOS disk service, to intercept the BIOS boot process. Then it can replace the BIOS boot process with one of its own, or it can merely modify the boot sequence by inserting its own boot actions into it, by preventing the BIOS from detecting certain devices as bootable, or both. Before the BIOS Boot Specification was promulgated, this was the only way for expansion ROMs to implement boot capability for devices not supported for booting by the native BIOS of the motherboard. After the motherboard BIOS completes its POST, most BIOS versions search for option ROM modules, also called BIOS extension ROMs, and execute them. The motherboard BIOS scans for extension ROMs in a portion of the "upper memory area" (the part of the x86 real-mode address space at and above address 0xA0000) and runs each ROM found, in order. To discover memory-mapped ISA option ROMs, a BIOS implementation scans the real-mode address space from 0x0C0000 to 0x0F0000 on 2 KiB boundaries, looking for a two-byte ROM signature: 0x55 followed by 0xAA. In a valid expansion ROM, this signature is followed by a single byte indicating the number of 512-byte blocks the expansion ROM occupies in real memory, and the next byte is the option ROM's entry point (also known as its "entry offset"). A checksum of the specified number of 512-byte blocks is calculated, and if the ROM has a valid checksum, the BIOS transfers control to the entry address, which in a normal BIOS extension ROM should be the beginning of the extension's initialization routine. At this point, the extension ROM code takes over, typically testing and initializing the hardware it controls and registering interrupt vectors for use by post-boot applications. It may use BIOS services (including those provided by previously initialized option ROMs) to provide a user configuration interface, to display diagnostic information, or to do anything else that it requires. While the actions mentioned are typical behaviors of BIOS extension ROMs, each option ROM receives total control of the computer and may do anything at all, as noted with more detail in the Extensions section below; it is possible that an option ROM will not return to BIOS, pre-empting the BIOS's boot sequence altogether. An option ROM should normally return to the BIOS after completing its initialization process. Once (and if) an option ROM returns, the BIOS continues searching for more option ROMs, calling each as it is found, until the entire option ROM area in the memory space has been scanned. Option ROMs normally reside on adapter cards. However, the original PC, and perhaps also the PC XT, have a spare ROM socket on the motherboard (the "system board" in IBM's terms) into which an option ROM can be inserted, and the four ROMs that contain the BASIC interpreter can also be removed and replaced with custom ROMs which can be option ROMs. The IBM PCjr is unique among PCs in having two ROM cartridge slots on the front. Cartridges in these slots map into the same region of the upper memory area used for option ROMs, and the cartridges can contain option ROM modules that the BIOS would recognize. The cartridges can also contain other types of ROM modules, such as BASIC programs, that are handled differently. One PCjr cartridge can contain several ROM modules of different types, possibly stored together in one ROM chip. The BIOS ROM is customized to the particular manufacturer's hardware, allowing low-level services (such as reading a keystroke or writing a sector of data to diskette) to be provided in a standardized way to programs, including operating systems. For example, an IBM PC might have either a monochrome or a color display adapter (using different display memory addresses and hardware), but a single, standard, BIOS system call may be invoked to display a character at a specified position on the screen in text mode or graphics mode. The BIOS provides a small library of basic input/output functions to operate peripherals (such as the keyboard, rudimentary text and graphics display functions and so forth). When using MS-DOS, BIOS services could be accessed by an application program (or by MS-DOS) by executing an INT 13h interrupt instruction to access disk functions, or by executing one of a number of other documented BIOS interrupt calls to access video display, keyboard, cassette, and other device functions. Operating systems and executive software that are designed to supersede this basic firmware functionality provide replacement software interfaces to application software. Applications can also provide these services to themselves. This began even in the 1980s under MS-DOS, when programmers observed that using the BIOS video services for graphics display was very slow. To increase the speed of screen output, many programs bypassed the BIOS and programmed the video display hardware directly. Other graphics programmers, particularly but not exclusively in the demoscene, observed that there were technical capabilities of the PC display adapters that were not supported by the IBM BIOS and could not be taken advantage of without circumventing it. Since the AT-compatible BIOS ran in Intel real mode, operating systems that ran in protected mode on 286 and later processors required hardware device drivers compatible with protected mode operation to replace BIOS services. In modern personal computers running modern operating systems the BIOS is used only during booting and initial loading of system software. Before the operating system's first graphical screen is displayed, input and output are typically handled through BIOS. A boot menu such as the textual menu of Windows, which allows users to choose an operating system to boot, to boot into the safe mode, or to use the last known good configuration, is displayed through BIOS and receives keyboard input through BIOS. Most modern PCs can still boot and run legacy operating systems such as MS-DOS or DR-DOS that rely heavily on BIOS for their console and disk I/O, providing that the system has a BIOS or BIOS-compatible firmware, which is not necessarily the case with UEFI-based PCs. Intel processors have reprogrammable microcode since the P6 microarchitecture. The BIOS may contain patches to the processor microcode that fix errors in the initial processor microcode; reprogramming is not persistent, thus loading of microcode updates is performed each time the system is powered up. Without reprogrammable microcode, an expensive processor swap would be required; for example, the Pentium FDIV bug became an expensive fiasco for Intel as it required a product recall because the original Pentium processor's defective microcode could not be reprogrammed. Some BIOSes contain a software licensing description table (SLIC), a digital signature placed inside the BIOS by the original equipment manufacturer (OEM), for example Dell. The SLIC is inserted into the ACPI table and contains no active code. Computer manufacturers that distribute OEM versions of Microsoft Windows and Microsoft application software can use the SLIC to authenticate licensing to the OEM Windows Installation disk and system recovery disc containing Windows software. Systems with an SLIC can be preactivated with an OEM product key, and they verify an XML formatted OEM certificate against the SLIC in the BIOS as a means of self-activating (see System Locked Preinstallation, SLP). If a user performs a fresh install of Windows, they will need to have possession of both the OEM key (either SLP or COA) and the digital certificate for their SLIC in order to bypass activation. This can be achieved if the user performs a restore using a pre-customised image provided by the OEM. Power users can copy the necessary certificate files from the OEM image, decode the SLP product key, then perform SLP activation manually. Cracks for non-genuine Windows distributions usually edit the SLIC or emulate it in order to bypass Windows activation. Some BIOS implementations allow overclocking, an action in which the CPU is adjusted to a higher clock rate than its manufacturer rating for guaranteed capability. Overclocking may, however, seriously compromise system reliability in insufficiently cooled computers and generally shorten component lifespan. Overclocking, when incorrectly performed, may also cause components to overheat so quickly that they mechanically destroy themselves. Some operating systems, for example MS-DOS, rely on the BIOS to carry out most input/output tasks within the PC. Because the BIOS still runs in 16-bit real mode, calling BIOS services directly is inefficient for protected-mode operating systems. BIOS services are not used by modern multitasking operating systems after they initially load, so the importance of the primary part of BIOS is greatly reduced from what it was initially. Later BIOS implementations took on more complex functions, by including interfaces such as Advanced Configuration and Power Interface (ACPI); these functions include power management, hot swapping, and thermal management. At the same time, since 2010 BIOS technology is in a transitional process toward the UEFI. Historically, the BIOS in the IBM PC and XT had no built-in user interface. The BIOS versions in earlier PCs (XT-class) were not software configurable; instead, users set the options via DIP switches on the motherboard. Later computers, including all IBM-compatibles with 80286 CPUs, had a battery-backed nonvolatile BIOS memory (CMOS RAM chip) that held BIOS settings. These settings, such as video-adapter type, memory size, and hard-disk parameters, could only be configured by running a configuration program from a disk, not built into the ROM. A special "reference diskette" was inserted in an IBM AT to configure settings such as memory size. Early BIOS versions did not have passwords or boot-device selection options. The BIOS was hard-coded to boot from the first floppy drive, or, if that failed, the first hard disk. Access control in early AT-class machines was by a physical keylock switch (which was not hard to defeat if the computer case could be opened). Anyone who could switch on the computer could boot it. Later, 386-class computers started integrating the BIOS setup utility in the ROM itself, alongside the BIOS code; these computers usually boot into the BIOS setup utility if a certain key or key combination is pressed, otherwise the BIOS POST and boot process are executed. In modern PCs the BIOS is stored in rewritable memory, allowing the contents to be replaced and modified. This rewriting of the contents is sometimes termed flashing, based on the common use of a kind of EEPROM known technically as "flash EEPROM" and colloquially as "flash memory". It can be done by a special program, usually provided by the system's manufacturer, or at POST, with a BIOS image in a hard drive or USB flash drive. A file containing such contents is sometimes termed "a BIOS image". A BIOS might be reflashed in order to upgrade to a newer version to fix bugs or provide improved performance or to support newer hardware, or a reflashing operation might be needed to fix a damaged BIOS. 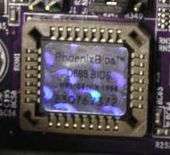 PhoenixBIOS D686. This BIOS chip is housed in a PLCC package in a socket. The original IBM PC BIOS (and cassette BASIC) was stored on mask-programmed read-only memory (ROM) chips in sockets on the motherboard. ROMs could be replaced, but not altered, by users. To allow for updates, many compatible computers used re-programmable memory devices such as EPROM and later flash memory devices. According to Robert Braver, the president of the BIOS manufacturer Micro Firmware, Flash BIOS chips became common around 1995 because the electrically erasable PROM (EEPROM) chips are cheaper and easier to program than standard ultraviolet erasable PROM (EPROM) chips. Flash chips are programmed (and re-programmed) in-circuit, while EPROM chips need to be removed from the motherboard for re-programming. BIOS versions are upgraded to take advantage of newer versions of hardware and to correct bugs in previous revisions of BIOSes. Beginning with the IBM AT, PCs supported a hardware clock settable through BIOS. It had a century bit which allowed for manually changing the century when the year 2000 happened. Most BIOS revisions created in 1995 and nearly all BIOS revisions in 1997 supported the year 2000 by setting the century bit automatically when the clock rolled past midnight, December 31, 1999. The first flash chips were attached to the ISA bus. Starting in 1997, the BIOS flash moved to the LPC bus, a functional replacement for ISA, following a new standard implementation known as "firmware hub" (FWH). In 2006, the first systems supporting a Serial Peripheral Interface (SPI) appeared, and the BIOS flash memory moved again. The size of the BIOS, and the capacity of the ROM, EEPROM, or other media it may be stored on, has increased over time as new features have been added to the code; BIOS versions now exist with sizes up to 16 megabytes. For contrast, the original IBM PC BIOS was contained in an 8 KiB mask ROM. Some modern motherboards are including even bigger NAND flash memory ICs on board which are capable of storing whole compact operating systems, such as some Linux distributions. For example, some ASUS motherboards included SplashTop Linux embedded into their NAND flash memory ICs. However, the idea of including an operating system along with BIOS in the ROM of a PC is not new; in the 1980s, Microsoft offered a ROM option for MS-DOS, and it was included in the ROMs of some PC clones such as the Tandy 1000 HX. Another type of firmware chip was found on the IBM PC AT and early compatibles. In the AT, the keyboard interface was controlled by a microcontroller with its own programmable memory. On the IBM AT, that was a 40-pin socketed device, while some manufacturers used an EPROM version of this chip which resembled an EPROM. This controller was also assigned the A20 gate function to manage memory above the one-megabyte range; occasionally an upgrade of this "keyboard BIOS" was necessary to take advantage of software that could use upper memory. IBM published the entire listings of the BIOS for its original PC, PC XT, PC AT, and other contemporary PC models, in an appendix of the Technical Reference manual for each machine type. The effect of the publication of the BIOS listings is that anyone can see exactly what a definitive BIOS does and how it does it. Phoenix Technologies was the first company to write a fully compatible and completely legal BIOS through clean-room reverse engineering. New standards grafted onto the BIOS are usually without complete public documentation or any BIOS listings. As a result, it is not as easy to learn the intimate details about the many non-IBM additions to BIOS as about the core BIOS services. Most PC motherboard suppliers license a BIOS "core" and toolkit from a commercial third-party, known as an "independent BIOS vendor" or IBV. The motherboard manufacturer then customizes this BIOS to suit its own hardware. For this reason, updated BIOSes are normally obtained directly from the motherboard manufacturer. Major BIOS vendors include American Megatrends (AMI), Insyde Software, Phoenix Technologies and Byosoft. Former vendors include Award Software and Microid Research that were acquired by Phoenix Technologies in 1998; Phoenix later phased out the Award Brand name. General Software, which was also acquired by Phoenix in 2007, sold BIOS for Intel processor based embedded systems. The open source community increased their effort to develop a replacement for proprietary BIOSes and their future incarnations with an open sourced counterpart through the coreboot and OpenBIOS/Open Firmware projects. AMD provided product specifications for some chipsets, and Google is sponsoring the project. Motherboard manufacturer Tyan offers coreboot next to the standard BIOS with their Opteron line of motherboards. MSI and Gigabyte Technology have followed suit with the MSI K9ND MS-9282 and MSI K9SD MS-9185 resp. the M57SLI-S4 models. EEPROM chips are advantageous because they can be easily updated by the user; hardware manufacturers frequently issue BIOS updates to upgrade their products, improve compatibility and remove bugs. However, this advantage had the risk that an improperly executed or aborted BIOS update could render the computer or device unusable. To avoid these situations, more recent BIOSes use a "boot block"; a portion of the BIOS which runs first and must be updated separately. This code verifies if the rest of the BIOS is intact (using hash checksums or other methods) before transferring control to it. If the boot block detects any corruption in the main BIOS, it will typically warn the user that a recovery process must be initiated by booting from removable media (floppy, CD or USB flash drive) so the user can try flashing the BIOS again. Some motherboards have a backup BIOS (sometimes referred to as DualBIOS boards) to recover from BIOS corruptions. There are at least four known BIOS attack viruses, two of which were for demonstration purposes. The first one found in the wild was Mebromi, targeting Chinese users. The first BIOS virus was CIH, whose name matches the initials of its creator, Chen Ing Hau. CIH was also called the "Chernobyl Virus", because its payload date was 1999-04-26, the 13th anniversary of the Chernobyl accident. CIH appeared in mid-1998 and became active in April 1999. It was able to erase flash ROM BIOS content. Often, infected computers could no longer boot, and people had to remove the flash ROM IC from the motherboard and reprogram it. CIH targeted the then-widespread Intel i430TX motherboard chipset and took advantage of the fact that the Windows 9x operating systems, also widespread at the time, allowed direct hardware access to all programs. Modern systems are not vulnerable to CIH because of a variety of chipsets being used which are incompatible with the Intel i430TX chipset, and also other flash ROM IC types. There is also extra protection from accidental BIOS rewrites in the form of boot blocks which are protected from accidental overwrite or dual and quad BIOS equipped systems which may, in the event of a crash, use a backup BIOS. Also, all modern operating systems such as FreeBSD, Linux, OS X, Windows NT-based Windows OS like Windows 2000, Windows XP and newer, do not allow user-mode programs to have direct hardware access. As a result, as of 2008, CIH has become essentially harmless, at worst causing annoyance by infecting executable files and triggering antivirus software. Other BIOS viruses remain possible, however; since most Windows home users without Windows Vista/7's UAC run all applications with administrative privileges, a modern CIH-like virus could in principle still gain access to hardware without first using an exploit. The operating system OpenBSD prevents all users from having this access and the grsecurity patch for the linux kernel also prevents this direct hardware access by default, the difference being an attacker requiring a much more difficult kernel level exploit or reboot of the machine. The second BIOS virus was a technique presented by John Heasman, principal security consultant for UK-based Next-Generation Security Software. In 2006, at the Black Hat Security Conference, he showed how to elevate privileges and read physical memory, using malicious procedures that replaced normal ACPI functions stored in flash memory. The third BIOS virus was a technique called "Persistent BIOS infection." It appeared in 2009 at the CanSecWest Security Conference in Vancouver, and at the SyScan Security Conference in Singapore. Researchers Anibal Sacco and Alfredo Ortega, from Core Security Technologies, demonstrated how to insert malicious code into the decompression routines in the BIOS, allowing for nearly full control of the PC at start-up, even before the operating system is booted. The proof-of-concept does not exploit a flaw in the BIOS implementation, but only involves the normal BIOS flashing procedures. Thus, it requires physical access to the machine, or for the user to be root. Despite these requirements, Ortega underlined the profound implications of his and Sacco's discovery: "We can patch a driver to drop a fully working rootkit. We even have a little code that can remove or disable antivirus." Mebromi is a trojan which targets computers with AwardBIOS, Microsoft Windows, and antivirus software from two Chinese companies: Rising Antivirus and Jiangmin KV Antivirus. Mebromi installs a rootkit which infects the master boot record. In a December 2013 interview with CBS 60 Minutes, Deborah Plunkett, Information Assurance Director for the US National Security Agency claimed that NSA analysts had uncovered and thwarted a possible BIOS attack by a foreign nation state. The attack on the world's computers could have allegedly "literally taken down the US economy." The segment further cites anonymous cyber security experts briefed on the operation as alleging the plot was conceived in China. A later article in The Guardian cast doubt on the likelihood of such a threat, quoting Berkeley computer-science researcher Nicholas Weaver, Matt Blaze, a computer and information sciences professor at the University of Pennsylvania, and cybersecurity expert Robert David Graham in an analysis of the NSA's claims. For comparable software on other computer systems, see booting. As of 2011, the BIOS is being replaced by the more complex Extensible Firmware Interface (EFI) in many new machines. EFI is a specification which replaces the runtime interface of the legacy BIOS. Initially written for the Intel Itanium architecture, EFI is now available for x86 and x86-64 platforms; the specification development is driven by The Unified EFI Forum, an industry Special Interest Group. EFI booting has been supported in only Microsoft Windows versions supporting GPT, the Linux kernel 2.6.1 and later, and OS X on Intel-based Macs. Other alternatives to the functionality of the "Legacy BIOS" in the x86 world include coreboot. Some servers and workstations use a platform-independent Open Firmware (IEEE-1275) based on the Forth programming language; it is included with Sun's SPARC computers, IBM's RS/6000 line, and other PowerPC systems such as the CHRP motherboards, along with the x86-based OLPC XO-1. ↑ The signature at offset +0x1FE in boot sectors is 0x55 0xAA, that is 0x55 at offset +0x1FE and 0xAA at offset +0x1FF. Since little-endian representation must be assumed in the context of IBM PC compatible machines, this can be written as 16-bit word 0xAA55 in programs for x86 processors (note the swapped order), whereas it would have to be written as 0x55AA in programs for other CPU architectures using a big-endian representation. Since this has been mixed up numerous times in books and even in original Microsoft reference documents, this article uses the offset-based byte-wise on-disk representation to avoid any possible misinterpretation. ↑ "Ref — System BIOS". PCGuide. Retrieved 6 December 2014. 1 2 3 4 Kildall, Gary A. (January 1980). "The History of CP/M, THE EVOLUTION OF AN INDUSTRY: ONE PERSON'S VIEWPOINT" (Vol. 5, No. 1, Number 41 ed.). Dr. Dobb's Journal of Computer Calisthenics & Orthodontia. pp. 6–7. Retrieved 2013-06-03. 1 2 Bradley, Tony. "R.I.P. BIOS: A UEFI Primer". PCWorld. Retrieved 2014-01-27. ↑ Swaine, Michael (1997-04-01). "Gary Kildall and Collegial Entrepreneurship". Dr. Dobb's Journal. Retrieved 2006-11-20. ↑ Shustek, Len (2016-08-02). "In His Own Words: Gary Kildall". Remarkable People. Computer History Museum. ↑ Kildall, Gary Arlen (2016-08-02) . Kildall, Scott; Kildall, Kristin, eds. "Computer Connections: People, Places, and Events in the Evolution of the Personal Computer Industry" (Manuscript, part 1). Kildall Family. Retrieved 2016-11-17. 1 2 Killian, A. Joseph "Joe" (2001). "Gary Kildall's CP/M: Some early CP/M history - 1976-1977". Thomas "Todd" Fischer, IMSAI. Retrieved 2013-06-03. 1 2 Fraley, Bob; Spicer, Dag (2007-01-26). "Oral History of Joseph Killian, Interviewed by: Bob Fraley, Edited by: Dag Spicer, Recorded: January 26, 2007, Mountain View, California, CHM Reference number: X3879.2007," (PDF). Computer History Museum. Retrieved 2013-06-03. ↑ "HP BIOS Configuration Utility". Hewlett-Packard. 2013. Retrieved 2015-01-12. ↑ "IBM 5162 PC XT286 TechRef 68X2537 Technical Reference manual" (PDF). August 1986. p. 35 (System BIOS A-5). Retrieved 2014-12-11. ↑ How StuffWorks: What BIOS Does. ↑ BIOS Boot Specification (Version 1.01, 11 January 1996) Archived April 22, 2012, at the Wayback Machine. ↑ Mueller, Scott (2001-06-08). "Processor Update Feature | Microprocessor Types and Specifications". InformIT. Retrieved 2014-04-15. ↑ "Linux* Processor Microcode Data File". Download Center. Downloadcenter.intel.com. 2009-09-23. Retrieved 2014-04-15. 1 2 "How SLP and SLIC Works". guytechie.com. 2010-02-25. Retrieved 2015-02-03. ↑ "Create and add an OEM ACPI SLIC table module to a congatec BIOS" (PDF). congatec.com. 2011-06-16. Retrieved 2015-02-03. ↑ Whitson Gordon. "A Beginner's Introduction to Overclocking Your Intel Processor". Lifehacker. Gawker Media. Retrieved 6 December 2014. ↑ Torres, Gabriel (24 November 2004). "Introduction and Lithium Battery". Replacing the Motherboard Battery. hardwaresecrets.com. Retrieved June 20, 2013. ↑ "Decoding RAM & ROM." Smart Computing. June 1997. Volume 8, Issue 6. ↑ "Upgrading Your Flash BIOS For Plug And Play." Smart Computing. March 1996. Volume 7, Issue 3. ↑ "Time To Check BIOS." Smart Computing. April 1999. Volume 7, Issue 4. ↑ Posted by Alex Watson, possibly repost from original content on custompc.com [unclear]. "The life and times of the modern motherboard". 2007-11-27. Retrieved 2 February 2013. ↑ David Hilber, Jr. (August 2009). "Considerations for Designing an Embedded Intel Architecture System with System Memory Down ®" (PDF). Intel. Retrieved 2 February 2013. ↑ Stiller, Andreas (2001). "Prozessor-Patches". c't (in German). Heise (5): 240. Retrieved 2015-11-21. ↑ "Award BIOS logo". 2015-06-15. Retrieved 2015-12-06. ↑ Sacco, Anibal; Alfredo Ortéga. "Persistent BIOS Infection". Exploiting Stuff. Retrieved 2010-02-06. ↑ Fisher, Dennis. "Researchers unveil persistent BIOS attack methods". Threat Post. Archived from the original on 30 January 2010. Retrieved 2010-02-06. ↑ Giuliani, Marco. "Mebromi: the first BIOS rootkit in the wild". blog. Retrieved 2011-09-19. ↑ "360发布"BMW病毒"技术分析报告". blog. Archived from the original on 2011-09-25. Retrieved 2011-09-19. ↑ Yuan, Liang. "Trojan.Mebromi". Threat Response. Retrieved 2011-09-19. ↑ "How did 60 Minutes get cameras into a spy agency?". CBS News. Retrieved 2014-04-15. ↑ Spencer Ackerman in Washington (2013-12-16). "NSA goes on 60 Minutes: the definitive facts behind CBS's flawed report | World news". theguardian.com. Retrieved 2014-01-27. ↑ "Windows and GPT FAQ". microsoft.com. Microsoft. Retrieved 6 December 2014. ↑ "Extensible Firmware Interface (EFI) and Unified EFI (UEFI)". Intel. Retrieved 6 December 2014. IBM Personal Computer Technical Reference (Revised ed.). IBM Corporation. March 1983. IBM Personal Computer AT Technical Reference. IBM Personal Computer Hardware Reference Library. 0, 1, 2 (Revised ed.). IBM Corporation. March 1986 [1984-03]. 1502494, 6139362, 6183310, 6183312, 6183355, 6280070, 6280099. Phoenix Technologies, Ltd. (1989) . System BIOS for IBM PC/XT/AT Computers and Compatibles — The Complete Guide to ROM-Based System Software (PDF). Phoenix Technical Reference Series (1st ed.). Addison Wesley Publishing Company, Inc. ISBN 0-201-51806-6. Phoenix Technologies, Ltd. (1989) . CBIOS for IBM PS/2 Computers and Compatibles — The Complete Guide to ROM-Based System Software for DOS. Phoenix Technical Reference Series (1st ed.). Addison Wesley Publishing Company, Inc. ISBN 0-201-51804-X. Phoenix Technologies, Ltd. (1989) . ABIOS for IBM PS/2 Computers and Compatibles — The Complete Guide to ROM-Based System Software for OS/2. Phoenix Technical Reference Series (1st ed.). Addison Wesley Publishing Company, Inc. ISBN 0-201-51805-8. Phoenix Technologies, Ltd. (June 1991). System BIOS for IBM PCs, Compatibles, and EISA Computers — The Complete Guide to ROM-Based System Software. Phoenix Technical Reference Series (2nd ed.). Amsterdam: Addison Wesley Publishing Company, Inc. ISBN 0-201-57760-7. Wikimedia Commons has media related to the BIOS. Look up BIOS in Wiktionary, the free dictionary.